Caught this moon showing up strong just as the sun was setting on a walk to the train one evening. 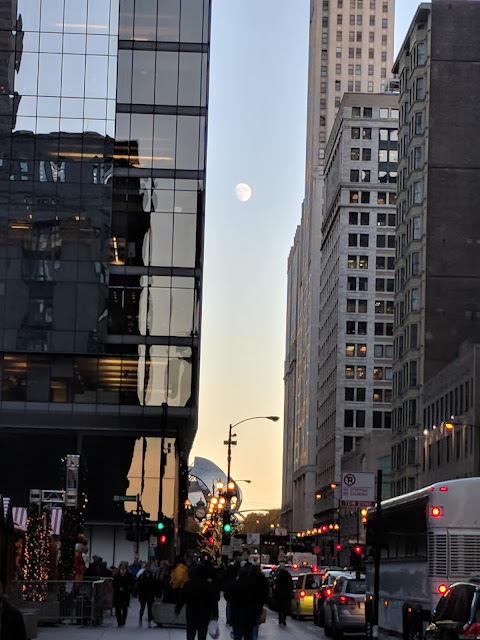 Nat alerted me to the moon based on her view in the suburbs and sure enough, framed right down the valley of high rises and above the Gehry pavilion: there she is! Lots of buzz around the Christkindl market and theatre crowds arriving for early dinners, but it was still worth stopping and enjoying.